This kaupapa has served as the general editorial policy of this blog and will continue to do so. This is an anti-conservative position, but it does not prescribe any specific political or ideological doctrine beyond that. While it may be tempting to describe the blog and its authors as conventionally "progressive" this alignment does not accommodate all our views. (Technical issues with the archiving of the post have since left the date a day out and misstates the author - if you go to it now). I established the Tumeke.org website for an online magazine Tumeke! in February 2004 - itself an idea in development from a few years before (as a print concept). And yes it's all very early Simpsons. This was a low key entry to the internet and not much content was generated in the first year. Then I got pissed off at the Sir Humphrey's blog crowd (since schisming into No Minister and NZ Conservative) over their Iraq belligerence, but found the only way to rebut them in their comments section, at the time, was if I had a one myself. 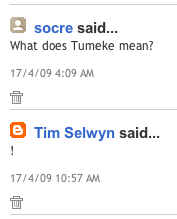 So I started the Tumeke! blog. Mr Bradbury began his occasional guest posts just a couple of months later. After the sedition trial result and my subsequent imprisonment in mid-2006 Mr Bradbury had to step in as acting blog editor. During this time I continued to write about my jail experiences and he posted them up - resulting initially in a political and media storm - one that did us no harm as far as traffic was concerned. Mr Bradbury set a cracking pace and produced a huge output covering many issues over this period and the blog became somewhat of a staple of the blogosphere audience's daily read. After being released the following year I gave the blog a spruce up and we went from having perhaps the most out-dated blog roll to the best - launching the nz blogosphere project in the 2008 New Year. The blog and the blog rankings began taking up so much time that the other Tumeke! channels were never really formed or fully operational the way they were intended to be. 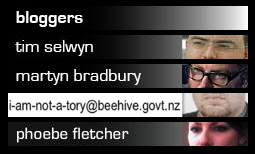 In early 2008 we were joined by our mutual friend Ben Thomas - then political editor of the NBR - who had to abandon blogging (or cross-posting) for a job with the new Attorney-General after National won the election (the move being one of the worst kept secrets of the press gallery). Not long after Mr Thomas joined us we were fortunate enough to have media and film studies lecturer and sometime comrade of Auckland University days, Phoebe Fletcher, start blogging - adding her flavour to the mix. That first post - now one of 4,450 - seems so long ago. Congratulations. And long may Tumeke prosper.